I am thoroughly convinced that no individual or nation can live by holding itself apart from the community of others.. .. Give and take is the law; and if India wants to raise herself once more, it is absolutely necessary that she brings out her treasures and throws them broadcast among the nations of the earth, and in return be ready to receive what others have to give her. In this quotation, Swami Vivekananda outlines, in brief, his fundamental strategy for national regeneration. To understand the strategy – outlined in this quote – it is important to gain some context. One approach, prevalent at the time of Swami Vivekananda’s life on earth, and holding currency even today is the path of negation. Reject wholly India’s traditions as conservative, ritualistic, lacking in “logic and reason”, and accept wholly the Western models as the only path to economic success. This means a wholesale acceptance of modern Western notions that are broadly clubbed as “liberal” and “secular”, as more ‘modern’ and enlightened. A second approach is the idea of development through aid and help from others. In order for India to regenerate, we need foreign help, foreign investments, foreign approval, foreign models of education, etc. This approach is built on the notion of our poverty, lack of capacity, and lack of ability to find our own answers which fit our needs. This approach, dominant for several decades even after independence, is less credible now, but continues to be an important path, at a tacit level, in many fields. A third approach is the vision of extreme national pride – bordering on jingoism – which states that all the answers that need to be found, have already been found and there is no need for an equal relationship between India and the rest of the world. This vision of civilizational superiority rests on our ideas of vast spiritual wealth and a belief that the rest of the world is bereft of such spirituality. Swami Vivekananda’s prescription needs to be contrasted with these approaches for us to grasp it better. Swami Vivekananda does not accept the path of negation, and in fact affirms strongly, the extraordinary wealth of spiritual and intellectual ideas and visions lying untapped in various Indian religious and secular traditions. At the same time, Swami Vivekananda does not accept the path of helplessness that states that we need foreign help to survive. Rather he proposes and elaborates, again and again, that we Indians are creators of our destiny and wants us to set ourselves to the task of finding answers to our own problems within our own communities and institutions. This means that we take responsibility – individually and collectively – to address our challenges rather than helplessly wait for Western solutions and models as easy go-tos whenever we face roadblocks. While both of the above are true, it is also true that Swami Vivekananda disliked the idea that we remain an insular nation – insular because of a strange mixture of spiritual and moral superiority combined with a deep feeling of inferiority at the intellectual and economic level. Swami Vivekananda favored genuine engagement, on equal terms between India and the rest of the world. He believed that such genuine engagement would expose the weakness in our thinking and approaches, while helping us polish what is already great in our culture. He believed that India had much to teach, and much to learn. 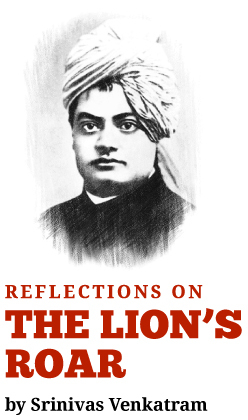 In other words, Swami Vivekananda believed that India’s pride in itself ought to be based on a genuine and deep self-esteem – personal, national, civilizational – combined with a profound respect of other civilizations and thought streams across the world. Swami Vivekananda's first remark “no individual or nation can live by holding itself apart from the community of others” is a call for genuine engagement between India and the rest of the world. A deep engagement built on genuine interchange of ideas – spiritual and intellectual, genuine respect for the other, combined with deep self-esteem and positive pride in our culture and civilization. His second remark “give or take is the law”, proposes that we be neither in the position of a taker – taking ideas and resources, particularly from the West, without the necessary internal effort and struggle to find our own answers; nor should we be in the position of a giver – carrying on our shoulders the belief and burden of an inviolable superiority of all that we have, and the belief that others can have nothing really valuable to offer us. His third remark, that India must be willing to ‘bring out her treasures and throw them broadcast among the nations of the earth’ provides two important pointers for us. One, that we must bring out our treasures which means renewed effort and energy in diving deep into several thousand years of unbroken civilizational continuity. Two, we will need to communicate these ideas and civilizational attainments to the rest of the world in a language and form that can help them understand the significance and value of those attainments for world culture. This remark is significant in the light of a vast university and research apparatus that has invested so little time and effort in re-discovering what we already have, leave alone communicating it and positively engaging with the rest of the world. so that what is old, dogmatic, and bereft of value, is thrown away, and what is ever new and valuable acts as a powerful fertilizer for contemporary culture, both in India and in all other countries across the world. Next Next post: Who are the true builders of society?